Pokémon Go is a phenomenon which is quickly taking over our cell phones. It has already surpassed Candy Crush as the biggest mobile game in US History (Mac Rumors). People are so engrossed in the game that they are watching their phone as opposed to their surroundings, and placing themselves in serious jeopardy; all for the reward of “catching ‘em all” before their friends. I personally am out of poké balls and am unable to join in on the fun at current moment… perhaps I’ll take a lunch time walk down to the nearest poké stop. However, my inability to participate aside, Pokémon Go is a very good application of Augmented Reality, and with the user base growing at such an alarming rate, it has caused many organizations to take pause and evaluate what seems to be endless opportunities in not only the game and its facets but in the delivery method itself. As per Merriam-Webster, “Augmented Reality is an enhanced version of reality created by the use of technology to overlay digital information on an image of something being viewed through a device (as a smartphone camera).” Companies have been trying to figure out ways to use augmented reality for years, typically its most effective application has been allowing people to see where storefronts are located from a user’s frame of reference. These pre-existing applications though cool were unable to break the walls down and collect a universal adoption of the technology. Pokémon Go, on the other hand, came in like a wrecking ball and tore down the walls inhibiting acceptance. Now that everyone is experiencing it, and appreciating what it has to offer, it now becomes a race to incorporate it into product offerings. So, how can this apply to the corporate learning environment? Pokémon Go is an incredible study on gamification. With the application’s GPS interface to Google Maps, landmarks are chosen as places for increased activity. Not only does this get a user out of the house away from their televisions, but it also makes them be active and run around cityscapes. It can dual in purpose as a means to view landmarks that have been long forgotten, as well as force social interaction that hadn’t previously existed. The game as it exists right now can be used as a Human Resources tool to endorse a healthy workplace, sessions of play could be organized once a week causing people to go outside together and communicate about who gets to catch what, which has turned into a positive interaction on college campuses across the United States. 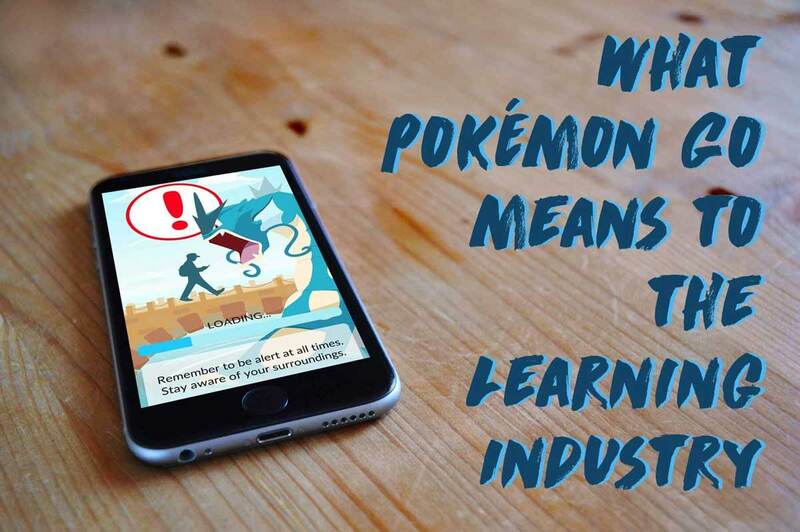 Pokémon Go is great as it is, however, the possibilities of new and more enthralling mLearnings are a real game changer for the learning industry. If your training arsenal consists of Instructor led training and elearnings and your user base is not as receptive to the teachings as they used to be, another option now exists. Imagine a company onboarding using Augmented Reality as a scavenger hunt around your facility. People can take a self-guided tour around your facilities and will think that their new employer is hip for developing such an environment for them. The real kicker is that based on the awards you structure in the environment there is a very high probability that users will remember a significant portion of their adventure, what the saw, where they were, and how they got there. On nicer days, games could be structured outside the facility to aid in employee morale, and eventually, we may get cool practical apps or glasses that can project emails and vital information right in front of us like in sci-fi movies of the past. Lending to even further advancements in mLearnings engagement and potential. People are obsessed with Pokémon Go, so much so that local restaurants, sporting venues, and other commercial entities are organizing get-togethers of players in order to capitalize on the wonder. People are fascinated with this new world layered on top of the one they have already been living in. I myself have been charmed by the application and find myself turning it on at night time just to see what’s around me as I’m sitting on the couch. As such, it is safe to say a well-executed mobile learning in augmented reality could captivate learners to levels we have yet to see, and it is up to instructional design developers to get us there. Social Feeds have aided in the Pokémon growth enormously. People post on social media their locations and what they are finding. Organizations are posting that they are Pokémon friendly and that if people engage with them on social media on their findings, they’ll send out promo items that will aid in their future conquests. It’s all sort of been a lot of excitement. With the increase of social settings in the learning world, gamified augmented reality applications could be further promoted internally via department social networks, adding another level of collaboration and interaction that would be completely new to our learning realm. In conclusion, embrace this new era of technology and what we can experience in our daily lives. There are incredible possibilities surrounding augmented reality and us as an industry should be exciting about the potential it holds. If you haven’t done so already, download Pokémon Go and try it out for yourself. You may be surprised at the inspiration you draw from it and most importantly, have fun. Also, please join me as I continue to look at new technologies or possibilities in the learning realm.